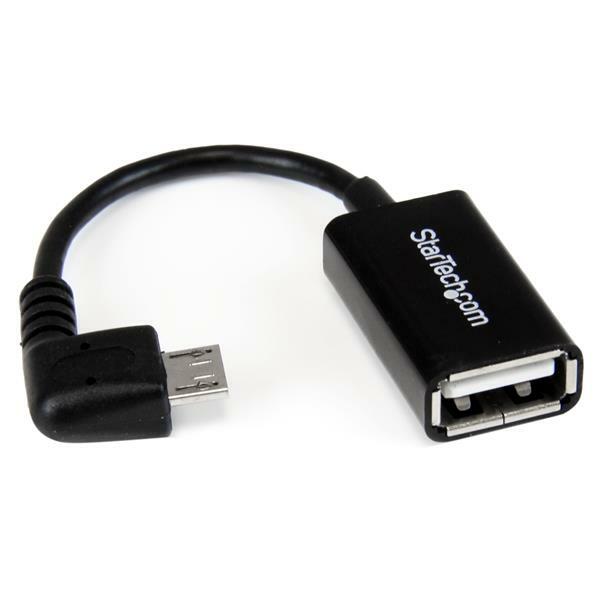 The UUSBOTGRA Right Angle Micro USB On-The-Go Adapter Cable converts your Micro USB OTG capable Tablet or Smartphone into a USB On-The-Go host, and enables you to connect a USB peripheral device such as a flash drive, or a USB mouse or keyboard, etc. – making it perfect for hectic schedules and people on the move who need to work while traveling. 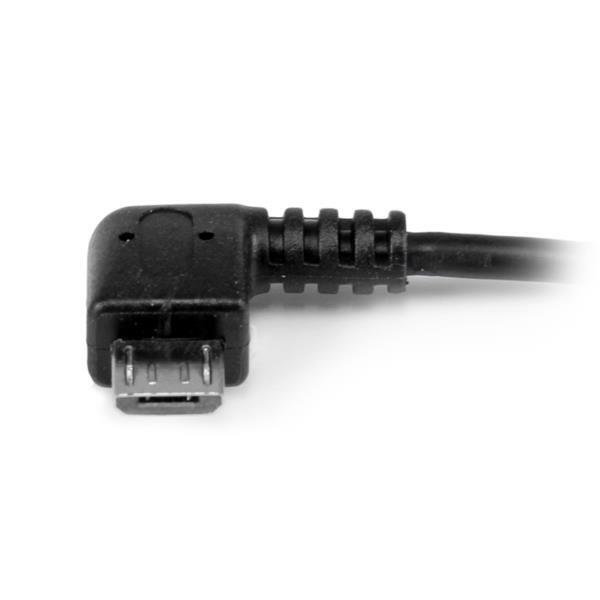 The right angle Micro USB connector allows you to position the cable and the USB device in such a way that you can still access your mobile device comfortably with reduced strain on the connection. 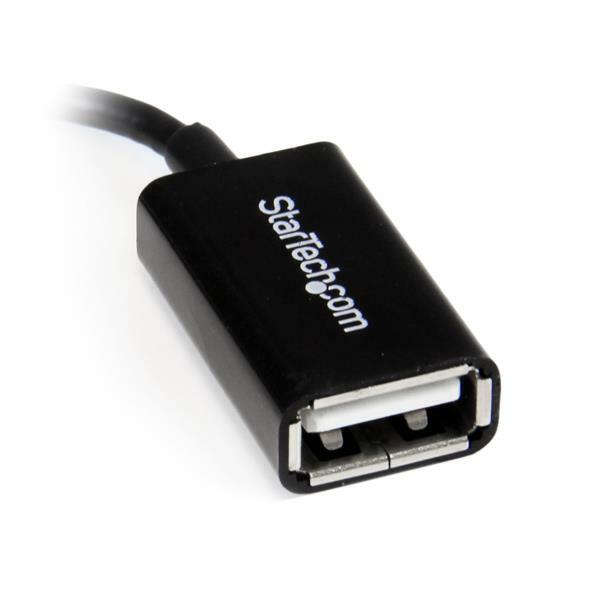 This OTG adapter cable is designed and constructed for maximum durability, to ensure dependable, long-lasting connections, and is backed by StarTech.com’s lifetime warranty. Please Note: This adapter will only work with devices that support USB OTG. Please consult your documentation and/or your service provider to ensure that your device does support USB OTG functionality. How can I tell if my device is OTG compliant? USB On-The-GO (OTG) allows mobile devices to act as a host for USB peripherals. To use OTG with a mobile device using a micro-USB connector, you need to use an OTG adapter to convert from the mobile device to USB. Although many mobile devices use the micro-USB connector and the OTG adapters plug into your mobile device, the mobile device must have OTG support. OTG support is a hardware specification on your mobile device and cannot be resolved using updates of any kind. To determine if your mobile device is OTG compliant, refer to the technical specifications of your mobile device. Use the OTG cable, USB peripherals(s), and attached media with another mobile device to see if the problem is with the components or the mobile device. Test the attached media on a computer system. Use a different mobile device, USB peripheral, and USB media in your setup to see if the problem persists. Ideally, you should test a component that you know works in another setup. The mobile device is compatible with OTG by verifying the mobile device's technical specifications. The USB storage device is using a file system that is compatible with your mobile device (for example, NTFS). The mobile device detects the USB storage device in a file browser (for example, Android File Manager). The USB peripherals have drivers compatible with the operating system of the mobile device. The USB peripherals are kept to a minimum and used only when necessary.